Pregnant women want instant relief from cold in pregnancy. Warsaw Jewish Penicillin offers a unique twist to the typical chicken soup recipe while retaining much of the classic flavor. The addition of garlic sausage and cabbage brings home the Warsaw Jewish Penicillin name. Prior to World War II, the Jewish population in Warsaw was comparable to New York with more than 350,000 Jewish citizens. The war took a huge toll on the Jewish population and recovery after the war did not greatly impact the Jewish community who had lost trust in Warsaw. 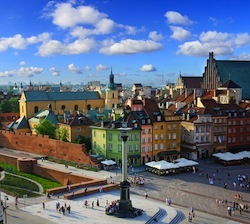 About 25,000 Jewish people currently reside in Poland with most living in Warsaw. Heat olive oil and unsalted butter in the bottom of a heavy Dutch oven or soup pot over medium heat. Cook onions and all spices for 10 minutes – stir often. Cut garlic sausage into rounds ½ inch thick. Add potatoes, garlic sausage and chicken stock to pot. Lower heat to medium and cook for 10 minutes – potatoes should be tender. Add cabbage and chicken to the pot. Cook for 5 minutes. Season the pot with salt and pepper to taste. Serve in soup bowls garnished with parsley. Variations: Warsaw Jewish Penicillin may contain a bit too much sodium from the stock and garlic sausage for women to feel comfortable fighting cold in pregnancy. The sausage can be removed, or less added to the soup pot.